Galleria Lorcan O’Neill Roma is delighted to present Aria, a project created by Stefano Minzi for the gallery’s annex space on via della Lungara. We have almost reached the renowned year of 2012, a date which has for thousands of years carried terrifying predictions; and after years of war in Iraq and Afghanistan (which in our daily life now pass unnoticed), there is military tension in Korea, natural disasters in Asia, the Mediterranean rises up with one collective voice and a close new war is in the news. 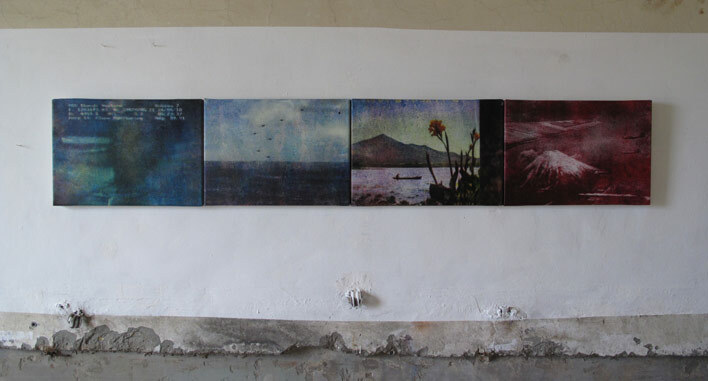 The series of works exhibited in this show were born out of this climate, as if the works themselves are photographic film which cannot but record what crosses the scene accidentally, even if they are originally intended to be a landscape or portrait. The works include references from real events as well as images that represent the emotional impact of current affairs (e.g. images from the artist’s dreams). The work of Stefano Minzi constantly expresses a wish to give form to the life of his intellect, his emotions, his family, not simply in isolation, but in relation to social and political life. It is also an attempt to put all the above within the framework of esoteric disciplines and astrology - a search for meaning of the simultaneous existence of very different realities (those of the artist’s personal experience alongside that which is happening or has happened in the world around him). The nucleus of the exhibited work can be pinpointed to a single dream the artist had in 2009. Leaning out of the window one morning, instead of being confronted by the usual urban London scene, the artist sees an ocean…the distance speckled by what appears to be a swarm of gnats, which approaching, reveals itself to be F16 warplanes flying in formation. The planes get nearer and nearer, increasing in size and number, until the sun is blocked from view. Much of Stefano Minzi’s work orginates from the nightmare of war. Fear of the atomic bomb, the absurdity of nuclear arms, premonitions of the end, are all at the heart of the artist’s project. Onto this is grafted something poetical that links these elements with private experiences as well as with philosophical, and in part, mystical knowledge. All the works in the exhibition are unique. The prints on canvas are handmade. The artist creates a work on paper in ink (a ‘model’ or ‘matrix’), then transfers the ink from that paper to the canvas. With coloured works, the artist transfers the ink four times, in black, in magenta, in blue and in yellow. The fragility of the ‘model’ or ‘matrix’, the mixing of the inks by hand, the numerous variables within the process means the finished canvases are rich in pictorial variation and nuance. For the works in this exhibition – Aquarius, Gemini e Libra - there is an additional element – a Plexiglas suspended in front of the canvas, on which black warplanes are printed. Stefano Minzi (1976) was born in Milan and works in Berlin. He graduated in the History of Contemporary Art in Rome and in 1998 attended the School of Ornamental Arts San Giacomo in Rome. In 2005 he moved to Berlin where he continued his printmaking and pictorial experiments. From 2007 to 2009 he undertook a Masters in Printmaking at the Camberwell College of Art in London. Stefano Minzi has exhibited widely in Italy and abroad. Amongst his solo shows - Galerie FMAB, Berlin; Galleria L’Affiche, Milan; Galleria AOCF58, Rome. He has exhibited in New York, Anchorage, Portland, Hamburg, London and Japan.